What’s the show? 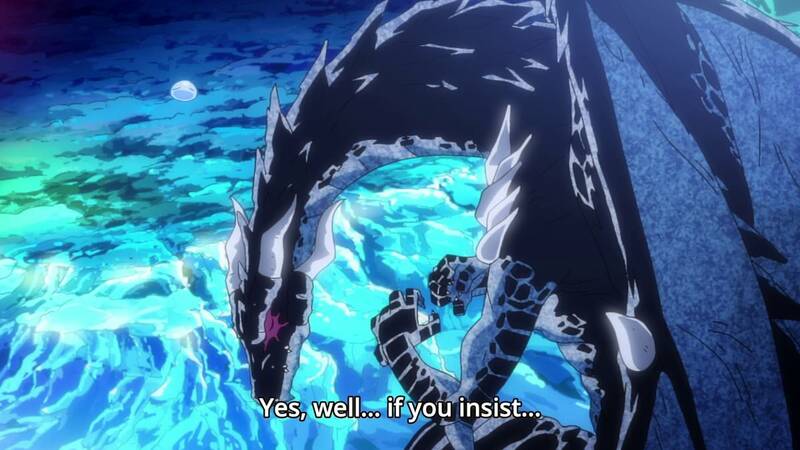 That Time I Got Reincarnated As A Slime, Episode 1. And… well I feel almost silly asking but what’s this new show about? Yup, it’s pretty much all there in the title, isn’t it?! 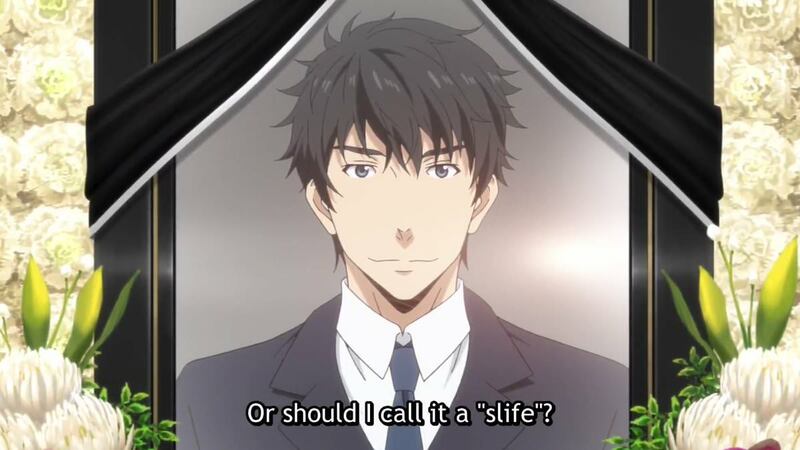 A guy dies in real world Japan, ends up reincarnated in a fantasy world in classic isekai fashion, except he’s not a man anymore he’s a ~slime~, i.e. the lowest of low-level enemies in RPG’s the world over! So a pretty simple concept then, huh? Well kind of, what’s surprising to me is not only how much time they spent establishing the fact our protagonist was more-or-less responsible for his reincarnation as a slime due to his dying thoughts and words after being stabbed by a knife wielding maniac. But also how intrinsic all his new forged abilities as a slime would be important to his new life going forward. How’s that then? How’s what? 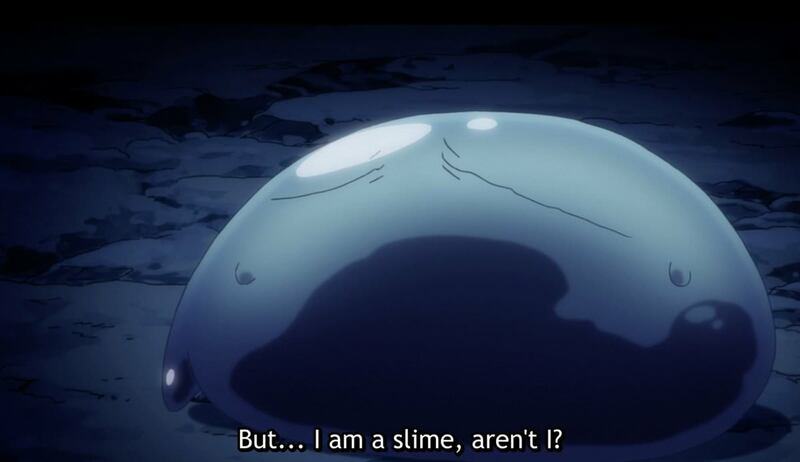 How do the protagonists dying words and thoughts end up reincarnating him as a slime in a fantasy world? 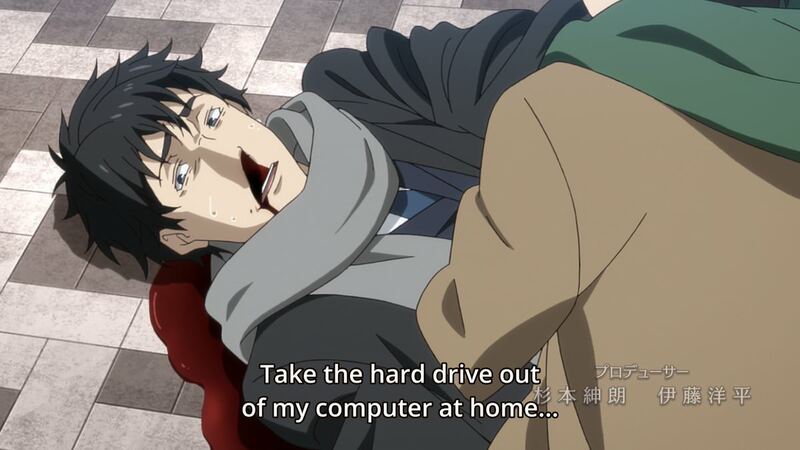 Well it’s sort of ~vaguely~ unexplained at this early stage in the anime, basically as he’s bleeding out on the sidewalk from a stab would and he begins commenting on things like being cold and being in pain and a ‘voice’ inside him begins giving him the attributes that will combat these negative ~feelings~ in his new life, like being immune to physical damage, having no blood, pain nullification and elemental resistances. Okay, I mean that explains why he reincarnates as a slime but I’m still at a loss to how? Karmic justice, yin and yang, etcetera, it’s all deeply engrained in Japanese society. So our protagonist, takes a blade to save the life of his younger kohai therefore ‘earning’ a second life of his choosing, but as to how this happens? Well there’s a hint in the episode that I gleaned which could be absolutely bull or it could be exactly what they were intending. 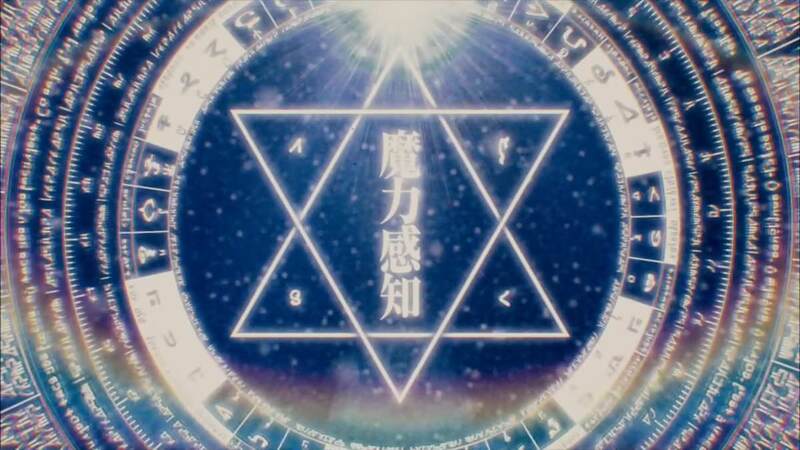 Basically our protagonist is a 37-year old virgin and there’s that old internet “meme” about if you turn 30 and are still a virgin you become a wizard, turn 40 and you’re a great sage, well this anime leans into it in what is some sort of self-fulfilling prophecy. That voice in his head that determines his reincarnated attributes seems in some way ~connected~ to the fact that he has magical abilities due to having remained a virgin for so long. There’s some really dynamic visuals in this show. What? Okay, so I love the idea of this series, I love the ‘execution’ of this concept, ~visually~ it’s top notch—especially the various animated visual cues with regard to our protagonist and the “skills” he’s learning. But man this episode is ~way~ too heavy on the exposition. It’s almost literally 25 minutes of inner-monologue and dialogue and I just wanted them to hurry up and get to something more interesting! I realise that for some people this might be a hard concept to rationalise or contextualise but I felt like this could have been done in half the time and been as twice as good! But then again maybe I’m being impatient—maybe this is exactly the amount of set-up we need for the eventual widening of this shows scope. Handy that the slime can make visual symbols like that to make up for a lack of a face. Well if you have complai— No! You know what, I don’t like how nit-picky this review is, this show does well to establish a tone and takes its time with its concept because it’s a faithful adaption of its source material (presumably—it certainly seems so if the 24 episode count on wikipedia is anything to go by!). I’m reminded of ‘Is It Wrong To Try To Pick Up Girls In A Dungeon’ and if this show can seek to encapsulate any measure of the magic that series had then we should all be so lucky! This show is funny and smart and entertaining and quirky and I ~eagerly~ look forward to next week’s episode! He’s responsible for the bad pun, not me! I’m kind of with you in that as much as I like the idea of this show and think it could be quite fun, this first episode is exposition and set up and it all feels like it takes too long. Maybe the information we get is important later, but I’m certain they could have found a faster or more interesting way to get it across. That said, I’m still kind of hopeful and given those who have read the source are still bouncing with joy about this anime I’m really hopeful for something fun from this title. Yeah it seems like those who read the novels are happy with it so I’m more than willing to give it the benefit of the doubt. Plus seeing that there’s 24 episodes of it means there’s plenty of time to have fun journeys going forward. Still, generic plots are fine but I kind of felt this episode was a little lacking in energy. Hopefully it finds it soon. The stuff with the other people looks cool. I’m just hoping we get to that stuff before like episode 9.